one amazing thing about living on the westside is proximity to the beach. i mean, that's pretty much the #1 reason to live here, coupled with the weather. ever since i moved to LA, i reasoned that if i'm going to pay what you have to pay to live in LA, i want to be as close to the beach as possible. yesterday, the weather was perfection. parker and i decided to hop on the Ballona Creek Bike Path for an afternoon adventure. this path goes all the way from culver city down to the beach. and we rode it to not just any beach, but manhattan beach. which for anyone unfamiliar with the LA area is about 10 miles one way. that makes 20 MILES, people! i am pretty proud of myself today, guys. and i'm also realizing that mama needs a new set of wheels. let's just say the ripped bike seat on my $20 yard sale bike doesn't cut it for that far. owie. anyway, we love this bike path! you can hop on around McConnell & Culver and take it all the way down to playa del rey. 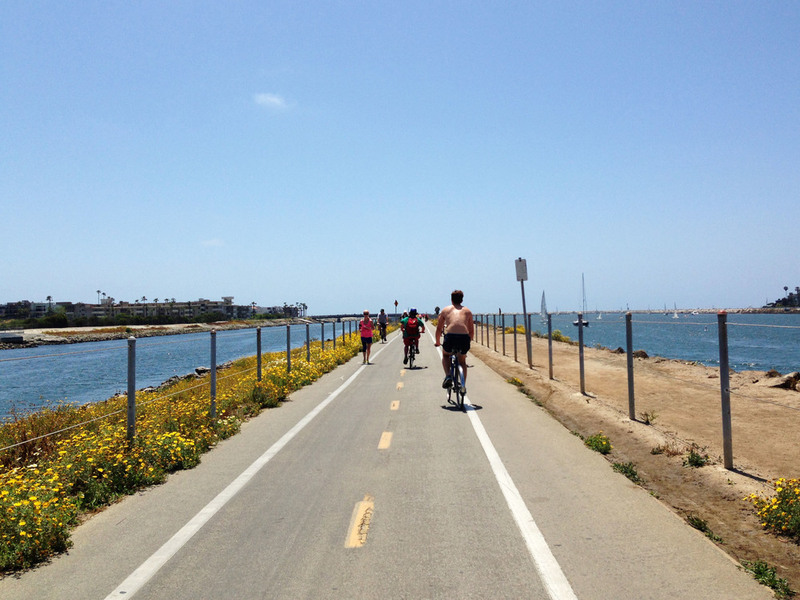 it opens up at my favorite spot in LA--the bridge between marina and playa del rey. playa del rey beach is one of the westside's best kept secrets. it's mostly locals, tons of beautiful beach, sand volleyball courts, great sailboat-watching in the marina, and it's never crowded. plus, you know i love houses and home decor, so it's fun to bike by the multi-million dollar homes and see all the varying styles. if you're going to take the bike path south to the south bay cities, i recommend going all the way to the strand by the manhattan beach pier. you can lock up your bike at the pier, and then wander around the beachside shops, restaurants, and homes. i've been jonesing some NY style pizza recently, so we popped into manhattan pizzeria. two slices of pepperoni and a coke to share were under 10 bucks. and seriously, pizza coke had never tasted so good (judge all you want, this was quite a splurge)! then we schlepped it back to mar vista to burn off that little meal. ;) all in all, a perfect sunday afternoon adventure! where's your favorite place to ride bikes? Posted on May 20, 2013 by Lauren Wilson and filed under family fun, LA, yummy and tagged pizza bike biking beach manhattan beach playa del rey ballona bike path.